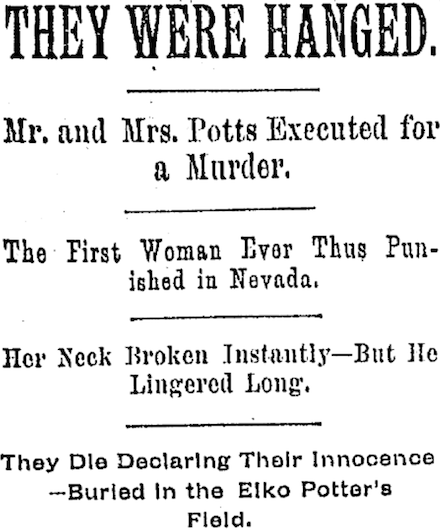 On this date in 1890, an affectionate married couple hanged together in Elko, Nevada, for a murder they insisted they had not authored. We obtain this headline and the associated (nationally circulated) story from the San Diego Union of June 26, 1890. ELKO, Nev., June 20. — Elko is in a ferment of excitement, many parties pouring in to witness the execution of the Potts family for the murder of Miles Fawcett in January, 1888. Over sixteen women have already applied for permits to witness the execution, which were refused. The conduct of Mrs. Potts during the past five days has been an alternation of hysterical crying, screaming and swearing at her husband, who mopes the time away in solitude. Yesterday morning at 5 o’clock she attempted to commit suicide, gashing her wrists and trying to smother herself. The vigilance of the death watch prevented further injury but she fainted from loss of blood. Both the Potts retired early last night in a nervous condition. At 10:30 o’clock the Sheriff read the death-warrants to Josiah and Elizabeth Potts. The reading of the warrant took place in the doorway of the latticed cell, which Josiah has occupied for so long a period. He stood in a despondent attitude, with his head bowed down against the iron bars, and not once during the reading of the warrant did he lift his head. His wife stood erect, clad in a neat muslin suit draped in black, with a red rose in her bodice. She was pale, but with a most determined aspect in every feature. During the reading of her own warrant only once did she show any emotion whatever, and she convulsively clutched her throat when her husband’s was being read, and when the words “hanged by the neck till you are dead” were reached, she gave a hysterical gasp and seemed to exhibit much feeling. The reading of the warrants was finished at 10:30, and both the condemned people emerged from the jail, where they had been confined for eighteen months, and proceeded outside the door to the yard between the Courthouse and jail, in which the scaffold had been erected. The sunshine relieved in a measure the gruesome surroundings. During the readings of the warrants, and evidently owing to the intense nervous strain on every one, a Deputy Sheriff was so overcome that he had to call for a glass of water. and Josiah Potts reiterated, “God knows we are innocent.” The gloomy procession led the way through a side door and with a bravery unexpected by the sixty-odd spectators, the condemned couple seated themselves on stools provided on the scaffold, while the deputies speedily proceeded to bind them with leather straps, Mrs. Potts helping to adjust them herself while Potts sat through it all in stolidity. Her husband reiterated in a hollow tone, “God knows we are innocent,” as the black caps were drawn over their heads. owing to her heavy weight. Her flacid [sic] flesh caused a rupture of the carotid artery and a stream of blood burst forth from under the chin of the dead woman, staining her white raiment. To the great surprise of all who had seen Potts’ emaciated condition his vitality was great, it being a fraction over fourteen minutes, as counted by the Associated Press reporter, before life was pronounced extinct by Drs. Meiggs and Petty. At 11:08 the body of Mrs. Potts was cut down when it was seen that her excessive weight on the five foot and a half drop had almost dissevered her head from the trunk, the muscles in the back of her neck alone supporting the connection. About nine minutes later Josiah Potts’ body was cut down and the body of himself and wife, in the absence of any claiming friends, were deposited in the potter’s field of the Elko grave yard half an hour later. After the interment of the bodies of Mr. and Mrs. Potts, District Attorney Love, accompanied by an Associated Press reporter, placed in the potter’s field all the remains of the murdered Fawcett known to exist above the earth. The box of bones had been in the District Attorney’s office at the Courthouse from the time when he first started to search for the criminals. for which the couple was executed was the murder of Miles Fawcett, 70 years of age, at Carlin, January 1st, 1888, because he insisted on being paid some money due from Potts. He visited Potts and this was the last seen of him until his dead body was discovered some months after by a person who rented the house formerly occupied by Potts. That’s the end of the Union article. Despite the incriminating circumstances of Mr. Fawcett’s disappearance, many people found the Potts’s insistence upon their innocence persuasive … especially after a last message from Elizabeth Potts reached public ears. Laramie (Wyoming) Daily Boomerang, June 24, 1624. Innocent or guilty, Elizabeth Potts remains the first, last, and only woman ever legally executed in Nevada. As of this writing (mid-2018) the Silver State has not had any woman on death row since Priscilla Joyce Ford died in 2005.